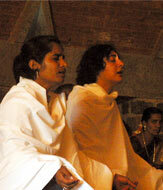 Dhyanalinga is a powerful and unique energy-form, representing the distilled essence of yogic sciences. Unsuccessfully attempted for thousands of years by many accomplished yogis, it is the first of its kind to be successfully consecrated and presented to the world. Dhyanalinga Yogic Temple offers a unique meditative space that does not ascribe to any particular faith or belief system, or require any rituals, prayers, or worship. Within its space, the intense yet subtle energies of the linga, allow one to experience the deepest states of peace and silence, revealing the essential nature of life itself. 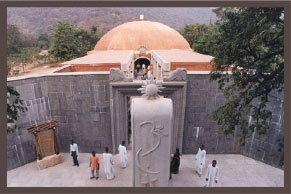 With the sculptural reliefs and symbols of Hinduism, Islam, Christianity, Jainism, Taoism, Zoroastrianism, Judaism, Buddhism, and Shinto inscribed on a colossal pillar, Sarva Dharma Sthamba, located at the front entrance, Dhyanalinga functions as an icon of singularity, bearing a universal message of welcome. As such, it offers a rare and potent opportunity for humanity to grow together into a state of peace, prosperity and well-being, beyond religious divide. As the focal feature of Isha Yoga Center, Dhyanalinga Yogic Temple with its Theerthakund, and the Linga Bhairavi Shrine, is rapidly becoming one of the most sought out locations for those seeking to experience and grow in meditation.